A Freedom of Information request submitted by The Express and Star has revealed that HS2 Ltd currently have 26 staff earning over £100,000 per year, with 18 of them earning more than David Cameron, who is on a salary of £142,000. In addition to this, it has been revealed that HS2 Ltd almost spent a million pounds on lawyers appearing in front of the HS2 Hybrid Bill Committee in the House of Commons up to January. New chief executive Simon Kirby remains the highest paid civil servant in the country, on a salary of £750,000. Although the appointment of Kirby was announced in January 2014, he did not start work with HS2 Ltd until June last year, as that allowed him to cash in on a £300,000 ‘loyalty bonus’ from previous employers Network Rail which had been intended to stop him from leaving that organisation. The full list of jobs HS2 Ltd are paying over £100,000 for. And no, we don’t think the Construction Logisitics Director is on two million, this information is exactly what HS2 Ltd sent out. 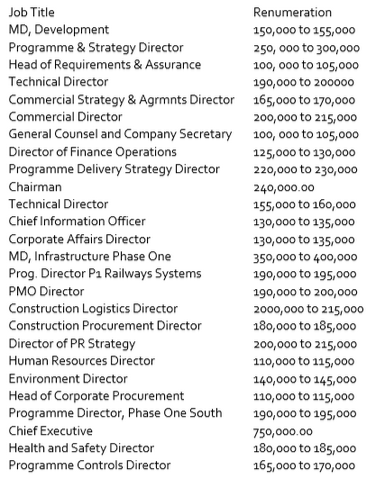 Managing director of infrastructure Jim Crawford is the second highest paid on the list, earning between 350,000 and £400,000, with strategy director Alistair Kirk at £250,000 to £300,000 and Colin Morris, programme delivery strategy director, on between £220,000 and £230,000. One name which sticks out is Tom Kelly, the former Blair spin doctor who is best remembered for his part in The Hutton Inquiry, when he compared deceased weapons expert Dr David Kelly to fictional fantasist Walter Mitty a week after his apparent suicide. Mr Kelly, who is on £200,000-£215,000 was once described by Ian Paisley as ‘making Machiavelli look like a rank amateur’, following the leaking of a document from the Northern Ireland Office which claimed there would be an all-embracing media propaganda campaign in which opinion polls would be manipulated in the run-up any referendum on the Good Friday Agreement. It is understood that since Mr Kelly joined HS2 Ltd, they have engaged Ipsos MORI to undertake polling on the project. Commercial Director Beth West is the highest paid woman at HS2 Ltd, earning £200,000-215,000, overtaking former CEO Alison Munro, who is now the Managing Director of Development. Despite her demotion, Munro now taking £150-155,000, up at least £35k from the £115,000 she was getting until last year as chair of the quango. Who is the highest paid woman at HS2 Ltd may have changed today following the appointment of Sadie Morris to head up the HS2 design review panel. The figures were released after a Freedom of Information request and also show that 176 staff members are paid more than £50,000. In addition to these salaries, a parliamentary answer to Cheryl Gillan MP has revealed that the legal team of five barristers and two QCs who have been representing HS2 Ltd at the Commons Hybrid Bill Committee, were paid hourly rates equating to £890,184 (inc VAT, 741,820 ex VAT) between April 2014 and January 2015. Bearing in mind that this period has included Parliamentary recesses, the total by now will have easily passed the million pounds mark. Wouldnt it be wonderful if remuneration was spelt correctly in the salary table for starters and secondly the ” Emperor’s New Clothes” idiocy about building a huge new rail system in an era of lightning fast communications, just to get to Birmingham a bit faster, was realised and shelved for the white elephant gravy train that it so obviously is. being conned into paying these people an obscene amount of money to carry on with this white elephant.Who has control of the purse strings?Certainly not the chancellor nor the P.M.
cream off any money leaving the rest of the population poor.Well it is happening here.IT MUST BE STOPPED. “Continued investment in rail (44%) and favourable mentions of high speed rail / HS2 (36%) are the main reason why 40% agree that they are satisfied with the Governments ( … rail related … ) transport policies”. Well Mr Kelly you are going to have to up your game. The sample surveyed was not the general public but rail journalists who almost by definition would prefer big dollops of cash to be spent on transport rather than keeping our armed forces at a decent level of trying to keep the wheels on the social care services. Even then 60 % clearly think the money proposed for HS2 would be better spent improving the network for everyone.